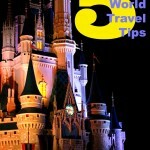 A popular vacation tip is to travel in the off season to avoid crowds and high prices. And, it’s a great tip most of the time. “Shoulder season,” that period just before and after prime season is a great way to save. But, travel in the off season isn’t always practical. Love to ski? You need snow. Kids in school? School districts discourage missing school for travel. Love the beach? It’s better when it’s warm! 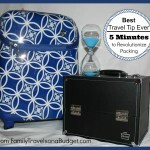 So, if you have to travel in peak season, these tips will make it easier! 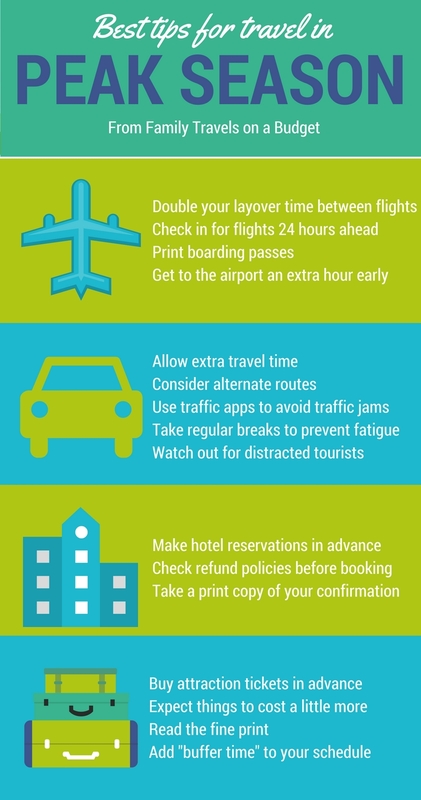 When booking flights, DOUBLE layover time (or more) between flights, especially if traveling to an area where weather delays are common. The high volume of air travel at peak times means there are fewer options to rebook if flights are delayed — so schedule a buffer to lessen the risk of missing a connection. This is especially true in winter when weather delays are common. Check in for flights 24 hours ahead. When you check in online, you save time at the airport. Print boarding passes. While many airlines offer “e-tickets” for cellphones, the high demand for wifi/cell service at crowded airports might make it hard to get a signal. And, it’s easier to rebook flights when you can hand the ticket agent your printed ticket. Get to the airport early. More people and more luggage mean longer lines for TSA. Allow more time to navigate the airport crowds to get to your gate. Get there early for less stress. Allow extra time to get where you’re going. The interstate system is built for a certain capacity of traffic. Throw in extra holiday traffic and the roadways can’t handle it. Bad weather makes it worse. Provide buffer time to get where you’re going to avoid the stress of getting behind schedule. Look for alternate routes. Consider state routes that parallel major interstates to take a break from the congestion on the highways. Use traffic apps to get around congestion. WAZE and other traffic apps were designed to help commuters get around rush hour traffic, but they help navigate around highway traffic, too. Familiarize yourself with these apps before travel and have a passenger do the navigating. Don’t drive distracted. Pay attention in touristy areas. Distracted driving is a major issue in congested, tourist areas like theme parks, beaches and even mountain resort areas. Vacationers driving in an unfamiliar area might make sudden stops or turns — often without using turn signals. Gawking is a big issue — even drivers get distracted by their first sight of Mickey Mouse or the cruise ship port. Distracted pedestrians also add to the risks. Be aware! Make hotel reservations early. The price goes up as supply goes down. Make special lodging requests (high floor, near the pool, etc) when you make your hotel reservation. High travel demand means fewer options the closer you get to travel time. Some resort policies state that any changes to your room request will be addressed on a first come-first served basis. Changing your request might move you to the bottom of the list. Consider return and exchange policies when using discount websites (such as hotels.com and priceline.com). While you might save a few dollars, it can be much harder to change or cancel a vacation reservation through discounters. Hotels.com‘s policy states that it does not charge a cancellation fee, but that the hotel you book through might. All cancellations are handled online. Priceline.com’s policy is more complicated, and you may not be able to cancel or modify your reservation. Buy attraction tickets in advance (ski lifts, snow tubing sessions, live theater, ice skating, etc). These experiences have a limited capacity, so purchase tickets you want early to avoid them being sold out. Budget extra for dining (at least 25%). When demand is high, there are fewer available discounts and specials. Read the fine print on restaurant gift certificates, Groupon and Living Social specials. Many restrict usage during primetime, such as Christmas or New Year’s Eve. Schedule buffer time into your plans. 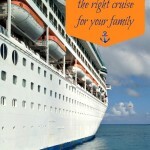 Heavy crowds make every step of the vacation process slower. Theme parks and cities (especially New York, San Francisco, Dallas, Chicago and Washington) get particularly crowded during peak season — which means it takes longer to get anywhere. “Hurry up and wait” is your mantra — expect it! And then, build in buffer time! 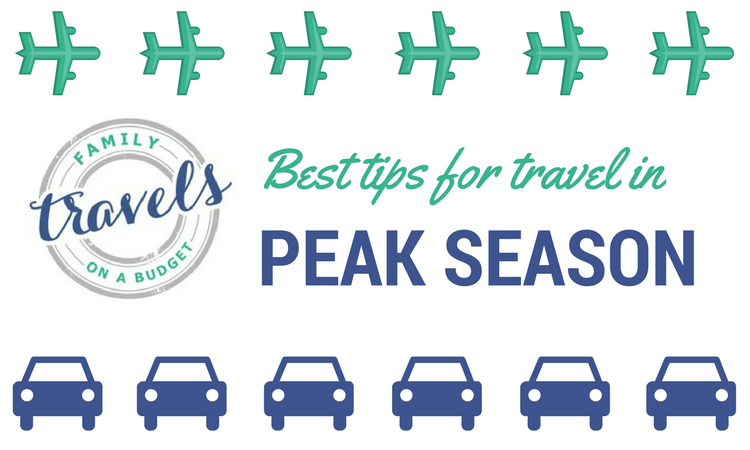 What’s your best tip to travel in peak season? Printing out all reservation confirmations for your trip is a good idea. Making sure you have the information you need with you to make your trip easier would be useful. I would imagine that you could also reserve a tour for your trip, especially if you are going to a different country so that you are able to find the best places safely and without getting lost. Great tip! I love tours early in a trip to a new place — especially large cities or areas where I don’t speak the native language. Thanks! Getting the hotels booked early can be a big saver I’ve found, for example I’m going to Cancun for 2018 new year and I’ve already booked my hotel because going on agoda now and there isn’t any difference between booking for high season or low season because as you so rightly said the price goes up when the supply has gone down. That’s awesome! You found a great deal AND you have an exciting new year’s celebration to look forward to!